Integration of COSEC CENTRA with third party applications can save a lot of time and money for any organization. COSEC offers multiple methods for such integrations including database to database, API and customized export templates. Matrix COSEC can be integrated easily with third party applications like ERP, payroll, HRM etc and third party functions such as time-attendance, access control, roster etc using different integration methods. 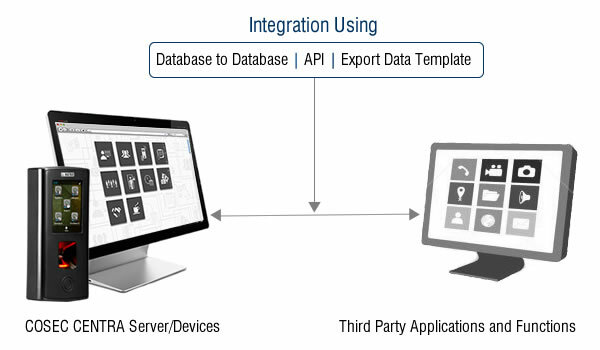 COSEC CENTRA can be integrated with third party software using database to database integration directly. Each third party software need user data for time-attendance in their specific format only. In Matrix COSEC, HR can create customized template as per third party software requirement from the available fields and export it into to CSV, Text, Excel and XML formats. Matrix COSEC Web API offers flexibility to integrate COSEC with any third-party applications or functions at three different levels as mentioned in below image. 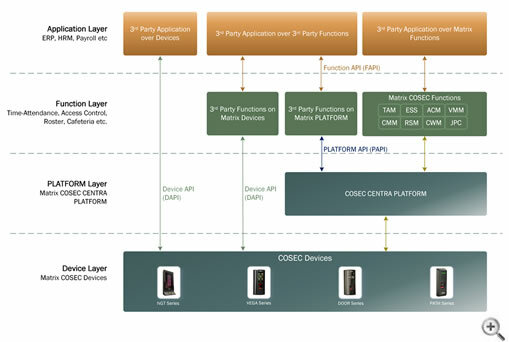 Matrix COSEC devices come ready with Device API for 3rd party application developers to develop their applications using Matrix COSEC devices. Matrix COSEC Device APIs (DAPI) allows other third party applications to communicate directly with the COSEC devices without need for COSEC CENTRA PLATFORM. Many application developers need application ready APIs. They expect the hardware vendors to manage device configuration, communication, enrollment and all such lower-level tasks. This saves them from the complexity of physical interfaces, network management, communication, device configuration, template distribution, etc. For such developers, Matrix COSEC CENTRA offers Platform APIs (PAPI). Matrix COSEC CENTRA PLATFORM manages all the lower level tasks shielding application developers from the tedious lower-level software engineering and offers them application-ready interfaces for simple and quick programming. Using PAPI, they can build their applications like time-attendance, access control, visitor management, cafeteria management, contract labor management and roster management on top of COSEC CENTRA PLATFORM. This is the highest level of interface Matrix COSEC offers for application to application integration. Using Function APIs (FAPI), Matrix COSEC functions like Time-Attendance can be integrated with other 3rd party applications like payroll, ERP, HRMS and CRM. Matrix COSEC is integrated with many widely popular applications like SAP, Oracle, Microsoft Dynamics NAV/AX, Tally and others.